The planning and execution of bridges is rated to special requirements and a limited service life. In the case of damage, changed use, modification and questions of residual service life, new verification of structural safety and usability is required. If the normal calculated verification is too uncertain because of imponderables or not feasible at all, it can be appropriate to analyse structural safety in situ to verify refurbishment ability or refurbishment success. In September2000 the DAfStb issued a technical recommendation for the experimental assessment of structural safety and usability of concrete structures. By now, the influence of pavement or floor layers and of other factors on the load carrying capacity is not known exactly. This thesis  investigates how road pavements, the geometry and bridge caps reduce the actions on concrete bridge structures and how these influences should be taken into account in the experimental evaluation of the bending capacity by an additional test load increment. Since the loading vehicle BELFA was completed in March2001, self-securing test loads can now be applied to bridges in the so-called large load circuit, i.e. the structure is loaded including supports and foundation. Shorter operation times and road block periods has increased the acceptance of loading tests among bridge owners. The results from the demolished bridge were verified at three other road bridges. The effective structure resistance eff RU of an existing structure is not known in spite of evaluation of the actual status. With consideration of the probable safety concept, during the loading test the structure is subject to loads in addition to the existing influences, and the effects on the structure (e.g. deformation) are measured. At the start of the test, the constant influences Gk,1 are present in their real quantity (fig.1). During the loading test, additional external loads are applied, the extent of which must be ascertained in advance in order to generate load conditions equivalent to the computed loads. The test limit load Flim which is not known before the test starts, must not be exceeded because this limit load is the point at which damage to the structure starts. Fig 1: Safety concept for loading tests (as per (Steffens et al., 2002a). ext Ftarget	-external part of test target load. In the vast majority of all practical cases, the possible damage limit i.e. test limit load Flim is not reached, because the test target load Ftarget including all safety parts is smaller. influential factors reducing the loads in the test. During the loading test, these influential factors can mean that the attempted load conditions in the structure are not reached. This resulted in the past in the requirement to remove structural layers for the loading test or take them into consideration accordingly when performing the test. In order to examine the problems, a reference quantity was defined as that physical quantity at which the structural safety assessment becomes extreme and therefore crucial. During the test planning stage, the engineer must stipulate which effect applies as prime reference quantity in the corresponding task (type of failure, crucial section/place). For the special task of defining the influence of the structural layers in solid bridges, the selected reference quantity has to allow for assessment of the load of a single fibre with differing cross section structure. Concrete tensile stress was selected as reference quantity. Given influential factors such as road surface etc. which reduce the attempted structural loads in the test and do not have the same permanent effect on the reference quantity, the test target load must be increased to compensate for the reduction by the overload share DF. It is then the test target load ext Ftarget= F+DF which generates the loads in the structure to be verified according to the regulations (fig2). Fig 2: Load components and test target load. Some influences are constant or are controlled by administration (e.g. replacement of surfaces) so that the full overload coefficient normally does not have to be taken into account. In the case of constant factors such as restraint effects from concrete joints or earth resistance on the abutments, it is presumed that this influence has the same favourable effects for the residual use period. These influences do not have to be taken into account in the form of an overload and can therefore be used as potential for a higher experimental bridge rating. The overload coefficient d is used to ascertain the overload shares DF. The overload coefficient dF in our case is ascertained from the ratio of the concrete tensile stresses resulting from the overload share DF and the test target load Ftarget Fig.2). It shows by how much the test target load has to be increased to compensate for example for the influence of the structural layers. The overload coefficient dtot refers to the total load from dead weight and traffic load and therefore also shows the percentage deviation when the joint carrying effect is not taken into account in the level of the total load. It can presume values larger than, smaller than or equal to 1. If there are several influences (road surface, protective layer, pavement areas), it must be discussed whether a leading effect is also defined for the partial overload coefficients, as for the combination coefficient Yo,i in the semi-probable safety concept, while the remaining overload coefficients are reduced. This would appear appropriate because the extreme case is unlikely. The test target loads are generally planned for certain marginal test conditions. The marginal test conditions such as temperature or material strength are however usually unknown at the planning phase and have to be estimated. For example, a lower ambient temperature at the point in time of the test results in an increased modulus of elasticity of asphalt and the joint carrying effect. Some marginal conditions (e.g. temperature) can be specified at the point in time of the loading tests. Correction coefficients for forecast changes should be defined during the planning stage so that the overload coefficient stipulated at this point by presumptions can be adjusted to the actual conditions. The correction coefficient V . then adjusts the ascertained overload coefficient to the currently valid value (formula1). The bridge erected in Bad Sülze in 1970 crossed a river bed (Recknitz) with a span of 12m and had suffered from safety-relevant damage so that traffic could only cross the bridge in one single lane. Due to flaws in building execution, large-scale corrosion had developed in the prestressing elements with partial failure of some of the prestressing elements so that the bridge classification had had to be reduced. 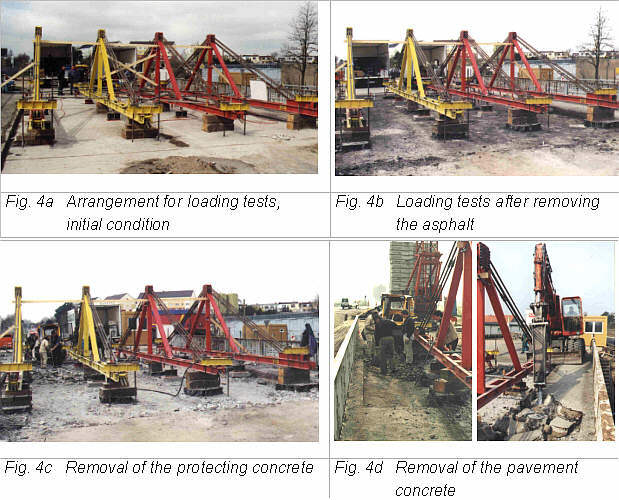 In addition, the lateral load-bearing ability was damaged by grouting faults between the precast girders (Fig.3). A solid support of structural steel frames had been erected under the bridge in case of a sudden loss of load-bearing ability. Fig 3: Cross section Bad Sülze bridge (mid-span). In view of the extreme damage, the bridge was to be demolished and a new one built. An auxiliary bridge was erected to bypass the building site during construction. The bridge was selected in cooperation with Stralsund road construction office, and made available for this thesis, for which we are very grateful. It was ideal for basic resarch into the effect of the structural layers, because it was available for a study period of approx. 2 weeks and could be loaded through to failure. The existing crash support also saved considerable money and time resources, because such a structure was necessary for the failure load test and could also be used as an independent measuring basis. After removing the individual layers, a load level had to be chosen for the loading tests which ruled out damage to the bridge. Four loading frames were positioned on the structure so that a mini excavator could still travel across the bridge to remove the rubble produced in the process. The test plan was based on the corresponding arrangement of the loading frames. The frames were anchored in the abutments with tie rods (Figs. 4a to 4d). The load was applied with hydraulic presses in controlled load cycles, based on the stipulations of the directive . 4 Without asphalt, protection/sloping concrete, pavement concrete. Additional symmetrical and asymmetrical load images were run for system identification and plausibility check. Every removal condition was concluded with a stress rupture test (reaction measurement under constant load). One direct result of a stress rupture test was that long load holding times to compensate for the effect of bitumen bonded structural layers result in uneconomical test periods (min. 30 min. per load cycle) so that this is not a suitable approach. Finally, the load was increased through to the technical limit load in an attempt to cause failure of the structure. As this was not possible, subsequently two precast girders (one damaged and one intact) were removed, equipped with measuring equipment and each loaded through to failure. Conventional technology was used to measure reactions in the structure (inductive position transducers, slope sensors, strain gauges and sonar emission analysis). By means of a hybrid analysis, i.e. a numerical simulation supported by experimental data, the influences of the pavement layers have been determined.The measurement results for the overall system and the individual removed girders were stimulated in the computer. The reference quantity was compared for the support structure with and without structural layers to ascertain the influence thereof. The correction coefficient was estimated by varying the stiffness of the individual layers. The procedure of including the structural layers with estimated stiffnesses in the computing model and creating a realistic model of the partial bond by considering the soft sealing layer has proven to be a good approach. Pavement acts as a quasi monolithic strengthening of the structure. Its temporary influence has to be taken into account when calculating the experimental target load. The resulting overload factor may exceed a value of 1.2. The influence on total loading is less than 4%. Some influences are constant or may be controlled administratively (e.g. the replacement of pavements) so that normally the full overload factor does not have to be taken into account. A reference quantity is required to determine the overload factor. In many cases, the concrete tensile stress is suitable as a reference for determining the contribution of pavement layers. The influence of the pavement layers normally reaches its maximum at mid-span. It may be estimated by an expensive 3D finite element analysis as well as by a plane model of the longitudinal section (with and without pavement, respectively). In spatial structures, the characteristic stresses are influenced by the actual geometry of the structure (e.g. including the concrete slope). Exact knowledge of the geometry is required for an estimation of critical local stresses. Bridge caps and cantilevers result in a stiffening of the border regions. In plate structures, the inner regions are unloaded for this reason. The design of the supports often causes an unintentional restraint. The resulting advantageous effect may be determined in a loading test. In situ concrete on prefabricated elements is mostly cast after a certain time period and in several layers. Insufficient bond disturbs the inner load circuit and may result in failure of the concrete joint. This effect needs to be taken into account in the structural analysis. In loading tests, the effect may be detected and quantified. Special thanks go to the supervisors of this thesis, , Professor Dr.-Ing. K.Steffens and Professor Dr.-Ing. habil. H.Opitz. Similarly, I would like to thank the staff at Stralsund road construction office, whose involvement in making the demolition bridge "Bad Sülze" available made the experiments possible in the first place. Gutermann,M. : Ein Beitrag zur experimentell gestützten Tragsicherheitsbewertung von Massivbrücken. Dresden, Technische Universität, Diss., unveröffentlicht.